I love finding new ways to interact with letters. 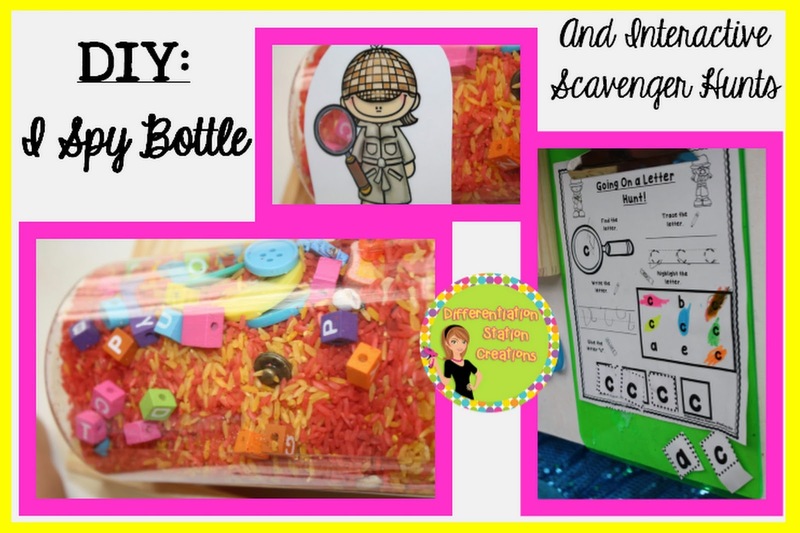 The “I Spy” bottle is an old stand-by, but can be used in lots of exciting ways. Kids love the chance to spin the bottle and find hidden treasure. 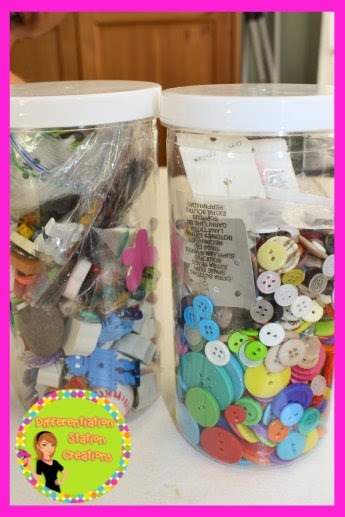 I created my own “I Spy” containers with my daughter. She wanted to be a part of the process. We started out by getting some plastic containers from Oriental Trading. I used two different sized containers. One large one for home and a smaller one for traveling. You can see the two I got here, but you can use any type of recyclable plastic bottles. 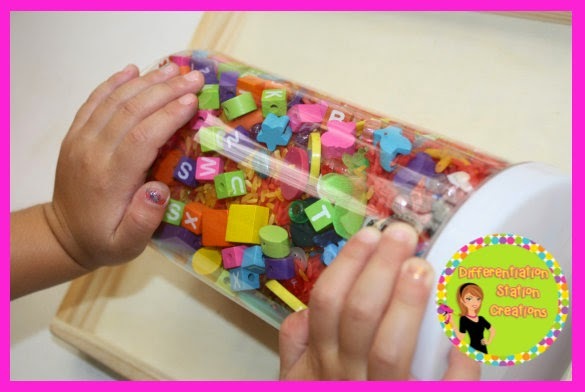 I found some Melissa & Doug alphabet beads on clearance and those became our letters for the jars. We dye rice for our sensory tub, so she was able to choose the colors that she wanted in the containers. She poured, I swept up the rest 🙂 We followed Jenn Drake’s directions to dye our rice. You can see that here. My daughter layered letters and other interesting objects between the different colors. I have collections of buttons, and all sorts of little objects. She went through all of them and we identified the beginning sound of each object, as she dropped it in the jar. Here is the completed container. We left about an inch and a half of empty space at the top. 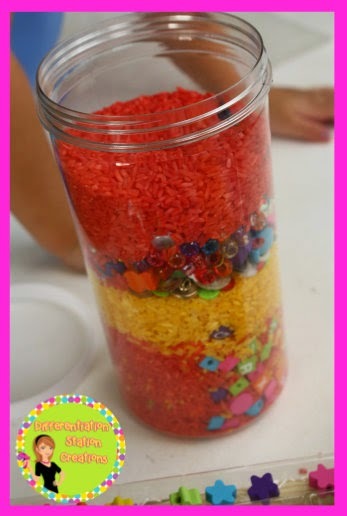 This allows the objects to move freely around the jar. I did not glue the top of my bottle, because I am using it with children in my home. If I were in the classroom environment, I would definitely super glue the top on the container. Here is our “I Spy:Scavenger Hunt” center. 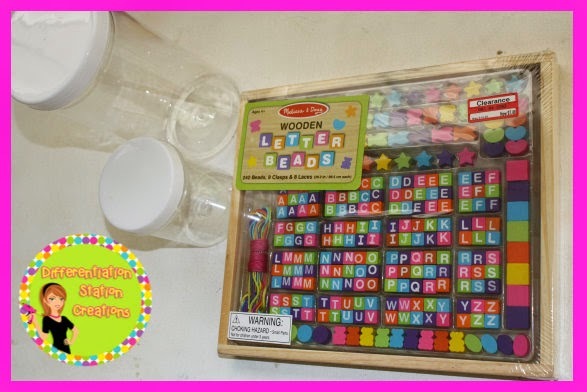 I kept the wooden box from the Melissa & Doug beads, to contain the “I Spy” bottle. This allows children to roll the bottle, but keeps it in a contained space. 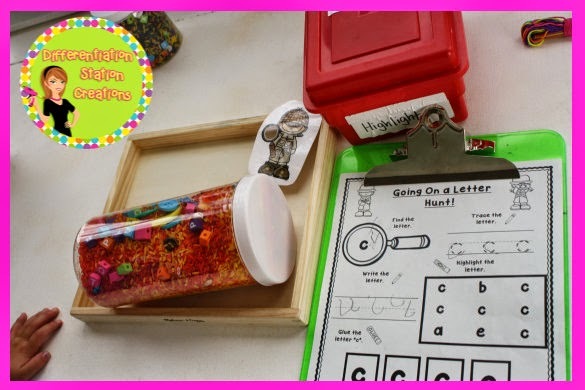 I have a focus wand and interactive letter worksheet from my Going On a Letter Hunt pack. 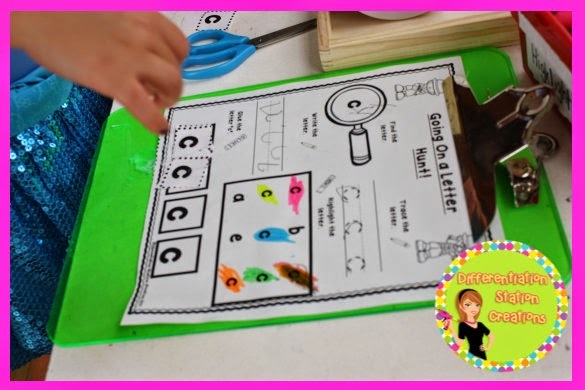 This particular worksheet is focusing on the lowercase letter “c”. The letters in our bottle are all uppercase, so my daughter had to recognize the lowercase letter and identify the corresponding uppercase letter. She had a ball with this activity! First, she found the letter “c” with her focus wand. This helped her to really bring her attention to the specific letter that she needed to find. Then, she spun the “I Spy” bottle until she found the capital letter “C”. She immediately scooped up her focus wand and highlighted the letter “C” in the bottle. She completed the rest of the letter hunt. 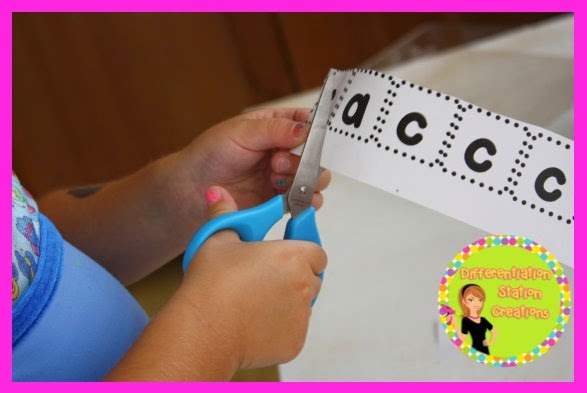 This includes tracing the letter, writing the letter, using visual discrimination to highlight the letter, and completing a cut and paste activity. The cut and paste activity is differentiated. There are two differentiated worksheets. In the easier version, there are less letters to cut out and students match the letters when gluing. In the harder version, there are more letters and students must identify and glue the correct letters in the four squares. Students must differentiate between the letters provided. We had more fun with the “I Spy” bottle. My daughter would find a letter and then write the letter on a dry erase board. She also was the teacher and gave me a letter that I needed to find. The possibilities are endless. 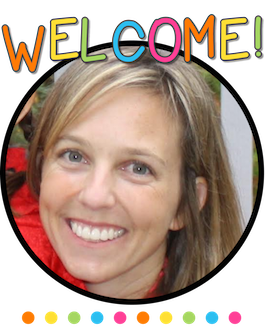 You can set this up as a partner station, where each student gets a chance to be teacher. The other student needs to find the specific letter. 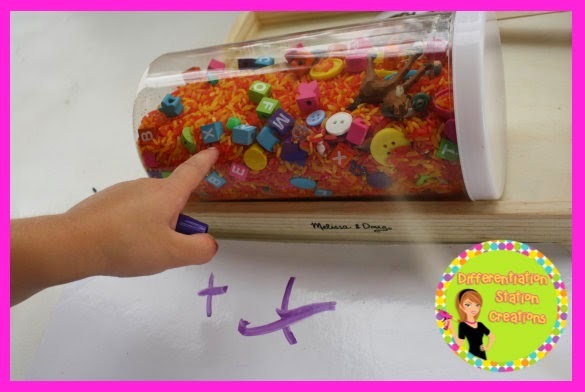 You can add writing the letter on dry erase boards to the activity. 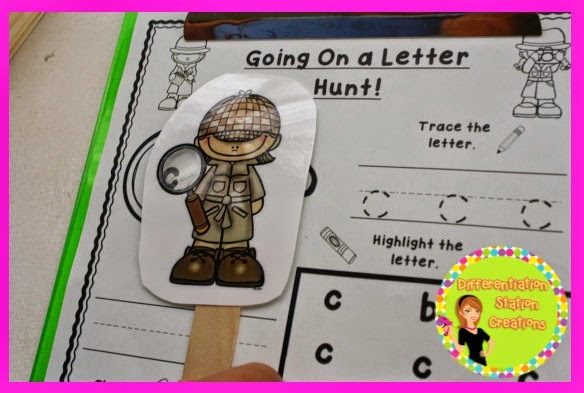 We use the Going On a Letter Hunt activities in so many ways! We use so many types of text: leveled readers, pocket chart poems, environmental print, word walls, picture books, chapter books, work sheets, posters, even words on food! My daughter LOVES them! I created a Going On a Word Hunt series for my son. He wanted to get in on the fun. 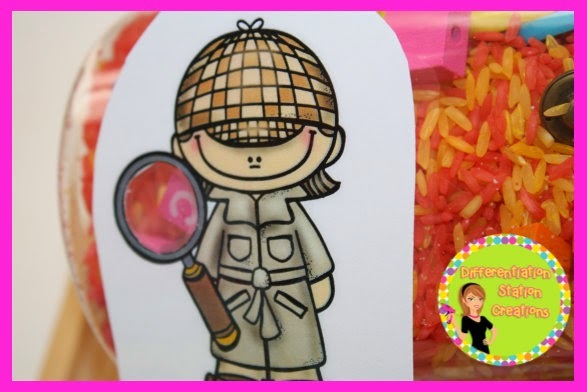 The beauty of these scavenger hunts is that they can be used with any text. 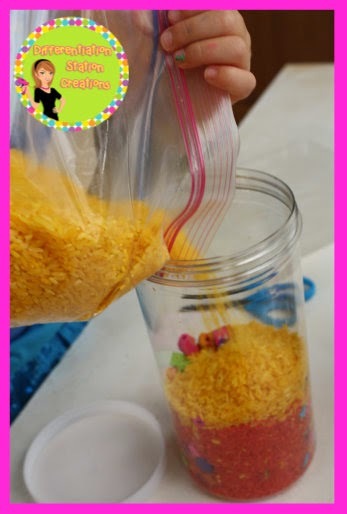 I hope that you found some fun ideas to use with your kids! 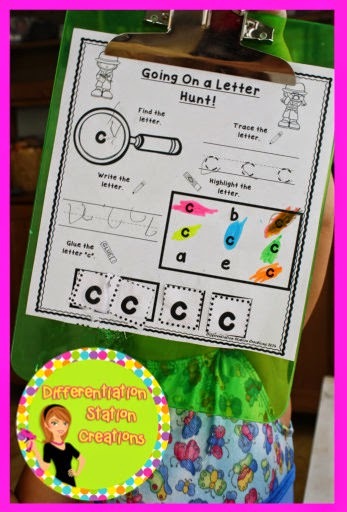 You can make your “I Spy” bottle with sight words, numbers, or anything your heart desires.